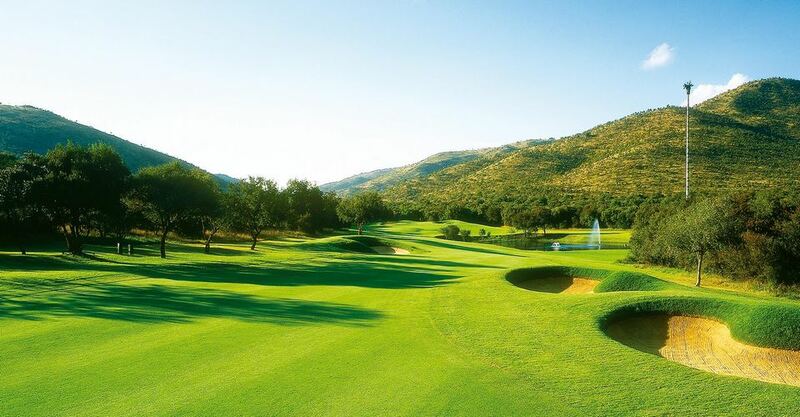 Visit a Sun City Golf Course in the Pilanesberg District. 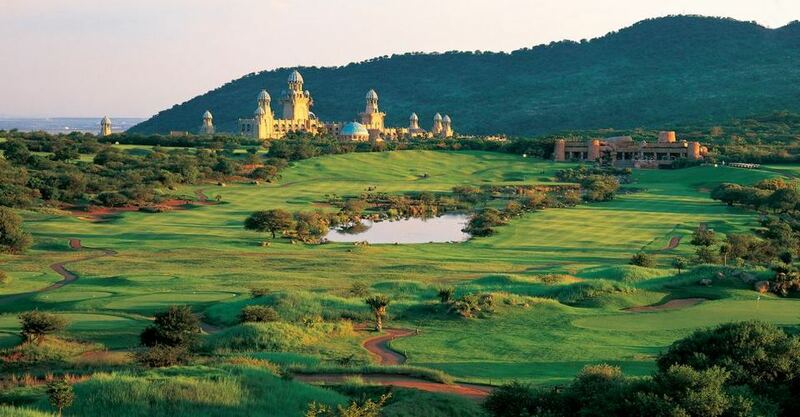 Sun City Golf boasts with one of the best and most pristine golf courses in South Africa. 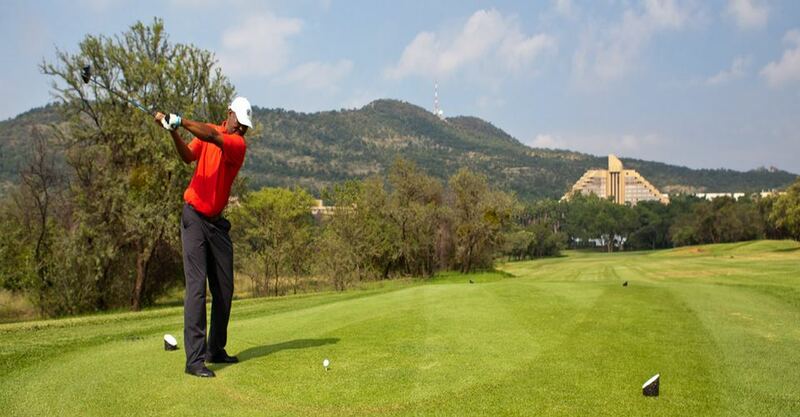 There are two renowned golf courses at sun city. 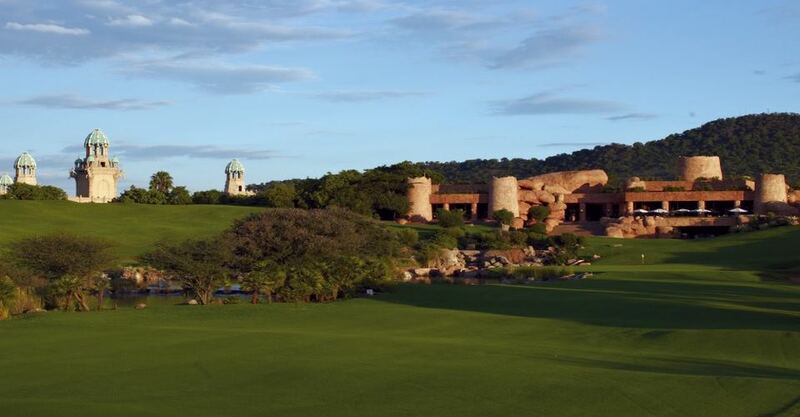 The famous Gary Player Golf course and the lost city golf course. 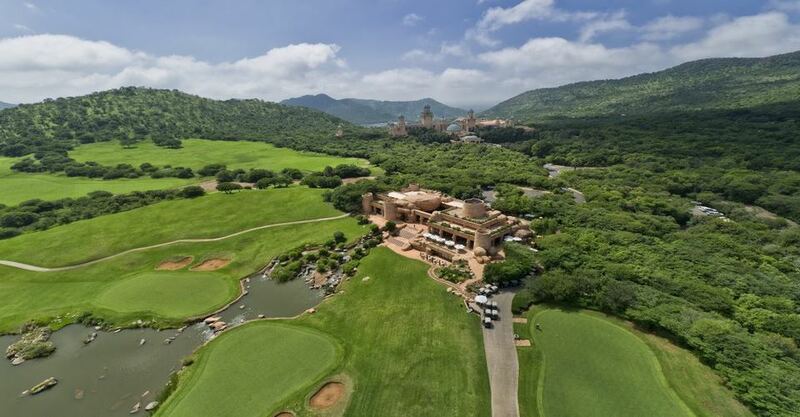 The Gary Player course is an 18-hole par-72 walking only championship course. This course comes highly ranked on the international level of golf courses. The Lost City Course offers a 72-par, 18-hole desert-style course. The course incorporates 28 000 square metres of water features and includes a water hazard at Hole 13 which is home to 38 live Nile crocodiles. The Lost City course is a desert style course. Golf carts and caddies are available here. 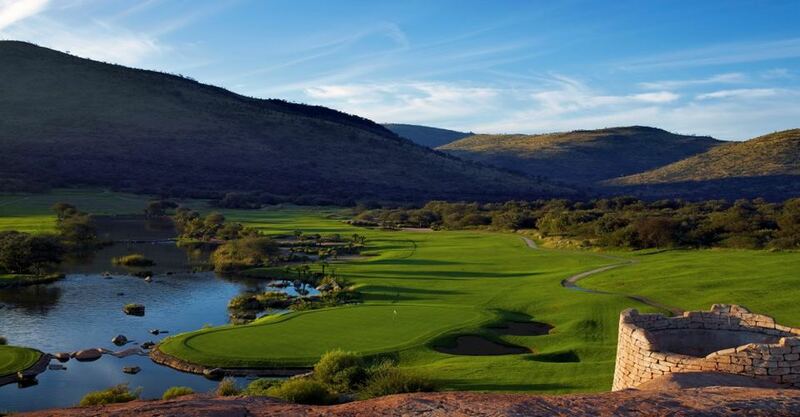 The Gary Player’s golf course was built in an extinct volcanic crater. The immaculate golfing paradise conforms to the stringent US PGA specifications. 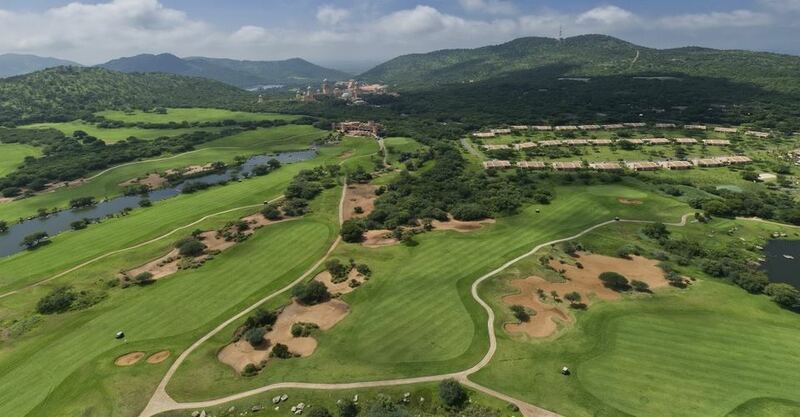 It is home to the Yearly Nedbank Golf Challenge which hosts some of the worlds best in the game. It was constructed in 1978 and is still one of the most prestigious golf courses in the world. There are no Golf Carts available at this course. You can, however, book a caddie. Hole 1: Par 4, Stroke 7, Length 403m: The ideal tee shot on this tough opening hole is to the left centre of the fairway. Avoid the bunker at all cost on the right side of the fairway. The green is well bunkered in the front, and dependent on the pin position a medium iron shot is required for your approach. Hole 2: Par 5, Stroke 13, Length 520m: The emphasis on this par five is driving accuracy. Once on the fairway, the player must decide to carry a massive dam on the right of the fairway. Or you can lay up to a narrow sloping section of the fairway on the left. A well-bunkered green with numerous pin positions awaits your approach. Hole 3: Par 4, Stroke 3, Length 411m: Accuracy is the key from the tee, with bush on the left and a bunker on the right. A medium iron approach to a three-tiered narrow green with bunkers on either side. Remember to use enough club, as the green is higher than meets the eye. Hole 4: Par 3, Stroke 6, Length 195m: The first par 3 is a hole where most players play conservatively for the centre of the green. Played from above it, the green presents a clearly-defined target but distance control here is again vital for shots that are short will land in the pond and balls that are long will make for a very nasty downhill putt. Hole 5: Par 4, Stroke 11, Length 449m: Don’t underestimate this straightforward hole. A short iron second shot can be very intimidating to this three-tiered well-bunkered green. The various pin position options make this hole, and only 30 % of the work is done after you have found the fairway with your tee shot. Hole 6: Par 4, Stroke 15, Length 388m: A long iron tee shot is ideal at this short par four. Any tee shot left of centre leaves a blind second shot over the bush. Favour the right side of the fairway, which will start a short downhill iron to a green guarded by bunkers in the front and at the back. Hole 7: Par 3, Stroke 17, Length 206m: Most will abandon any pretence of aiming for the flag. They will happily settle for the safety of the green. Surrounded by a horseshoe of sand and partly hidden from the tee, a finish on the putting surface is achievement enough. Hole 8: Par 4, Stroke 1, Length 450m: The tightest hole on the golf course requires an accurate tee shot to a fairway surrounded by dense bush. Avoid the water hazard running across the fairway leaving a medium to long iron uphill approach to a sloping green. 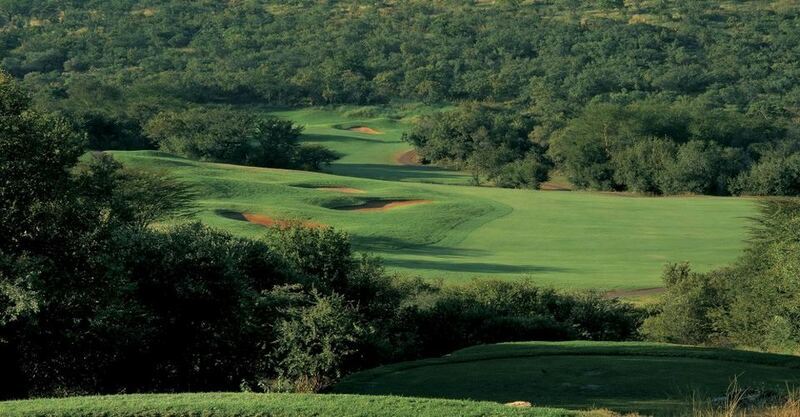 Hole 9: Par 5, Stroke 5, Length 545m: The signature hole at the Gary Player Country Club. This par 5 is a pure three shooter for most golfers. The island green is more susceptible to a short iron third shot rather than a long fairway wood for the brave. Par 5 is always a good score. Hole 10: Par 5, Stroke 16, Length 500m: This straightforward looking par five places emphasis on the second shot. The green is not visible for the second shot due to a large bunker on the prominent mound 75 metres short of a narrow green. Playing the third shot from the fairway is essential. Hole 11: Par 4, Stroke 10, Length 419m: This dogleg left requires an accurate tee shot. The tee shot must carry a small slute and land short of a menacing fairway bunker. Once on the fairway, a candid second shot awaits the players. Cut off as much of the dogleg at your peril. Hole 12: Par 3, Stroke 14, Length 200m: It looks straightforward, but this par 3 demands an accurate tee shot. Mainly when the pin is at the front of the green. Under hit shots will fall in the sand at the front. While too much club will see the ball run to the back of a testing green. Hole 13: Par 4, Stroke 2, Length 406m: Two bunkers await the overhit or pulled tee shot. It can make it a very long uphill journey to a testing green. You can use enough club on this severely sloping green. Hole 14: Par 5, Stroke 8, Length 550m: You need an accurate tee shot on this dogleg right par 5. Players wishing to hit the green in two must beware the large waste bunker with punishing pampas grass surrounding the green. The sensible play is to lay up leaving a short iron for the third shot. Hole 15: Par 4, Stroke 6, Length 431m: Favour the right with the tee shot and the left with the approach to weaving a path between the bunkers. If the player gets into a good position off the tee, the pin is vulnerable, making this hole an excellent birdie opportunity depending on the pin position. Hole 16: Par 3, Stroke 18, Length 193m: The water on the left does not come into play. Instead sand around the green is the hazard again. 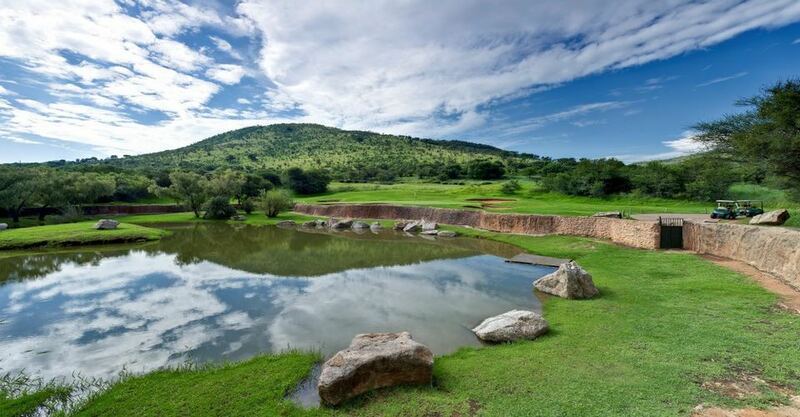 The shortest of the par 3’s, the action here matches the dramatic view of Sun City from the green. Hole 17: Par 4, Stroke 12, Length 437m: The sand Guards the dry route to the tee shot must split a fairway rolling right to the left towards the water. Accuracy is the key as any perfect tee shot leaves a short iron into the green. Hole 18: Par, Stroke 4, Length 459m: The tee shot must lay up short and right of the water, leaving a long second to an undulating green protected the front right and left by bunkers. Use the club, as this shot is longer than it looks. The target can incredibly intimidating on this dogleg left a closing hole. Bakgatla Resort is situated at the foot of Garamoga Hill. 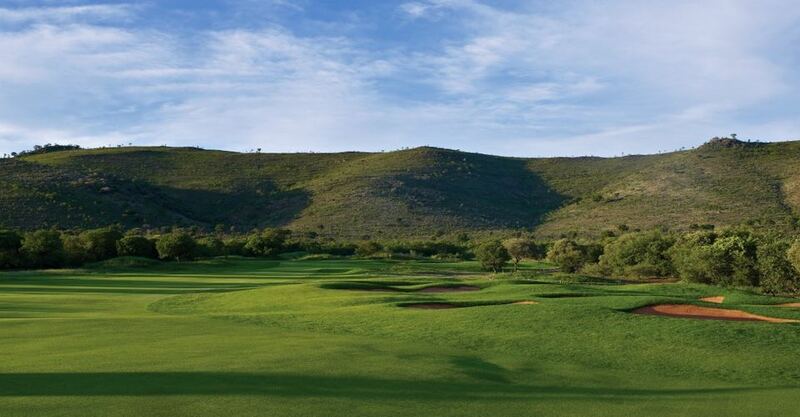 The resort offers a perfect weekend and mid-week getaway to Pilanesberg National Park. Black Rhino Game Lodge is our recommended lodge in the private reserve located near the Pilanesberg. Book now for a value for money treat. Buffalo Thorn Lodge is one of the private luxury lodges inside the Pilanesberg National Park. Visit this exclusive lodge this season. Book Now. Ivory Tree Game Lodge is one of our favourite lodge destinations near the Pilanesberg Game Reserve. Book now and visit the Pilanesberg. Pilanesberg Tented Safari Camp is situated in the Manyane Resort within close proximity of the malaria-free Pilanesberg National Park that host the Big 5. Tambuti Game Lodge.One of the best private and exclusive lodges in the Black Rhino Game Reserve. Situated near Pilanesberg Reserve. This Pilanesberg Day Tour (open vehicle) in Pilanesberg is perfect for those who have a short stay in the city and wish to make an escape into the bush. Pilanesberg Victoria Falls and Chobe Tour. This is our top safari package for 2016. Book now and explore Pilanesberg,Vic Falls and Chobe like never before! Black Rhino Lodge Safari has been rated as the best value-for-money safari in Pilanesberg. This a 4-star Luxury Safari at affordable rates. Book now. This 3 Day Pilanesberg Accommodated Safari is a very popular tour and a great recommnded visit to the Pilanesberg National Park. Book Now. Pilanesberg Luxury Lodge Safari offers the perfect mid-week escape. Visit the Pilanesberg Game Reserve this season. Book now. This Pilanesberg Day Tour(open vehicle with lunch) is the ideal way to spend your day away from the city with a driver who will pick you up at your hotel. Black Rhino Table Mountain safari package offers a great Beach and Bush safari. Big 5 meets Big 6 Cape Town. Malaria Free Zone - Book Now. Pilanesberg National Park is Big 5 Country & Malaria Free. Rated the best value for money National Park in South Africa. Contact us today for all your Pilanesberg bookings.